(Trent Nelson | The Salt Lake Tribune) Utah Jazz guard Kyle Korver (26) and Utah Jazz center Rudy Gobert (27) high-five. Utah Jazz v San Antonio Spurs, NBA basketball in Salt Lake City on Tuesday Dec. 4, 2018. The Weekly Run is a weekly Salt Lake Tribune newletter on the Utah Jazz. Subscribe here. There was quite a bit of attention paid to the Jazz’s outside shooting Tuesday night, and deservedly so. But what about the defense? After all, LaMarcus Aldridge torched Utah for 45 points in their previous meeting last March. 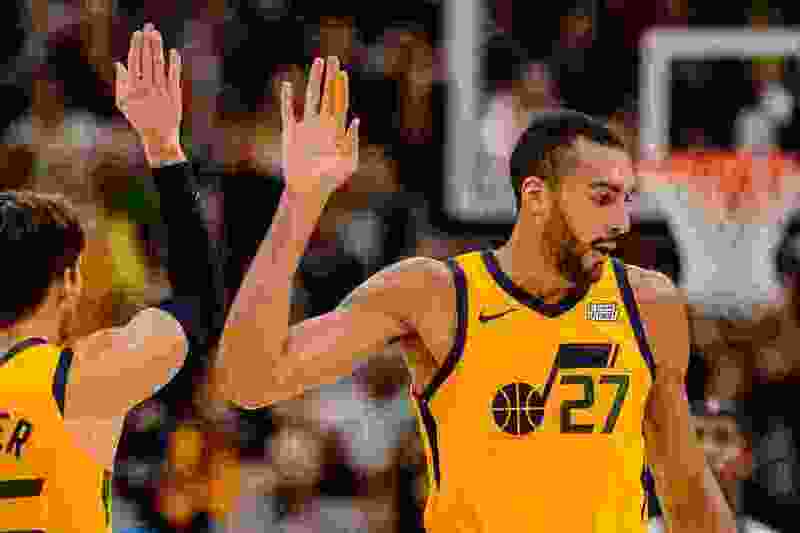 On San Antonio’s first possession, Rudy Gobert, sagged off a bit too far, and the sweet-shooting big man drained an easy jumper, prompting Jazz coach Quin Snyder to yell at Gobert to get closer. Aldridge scored eight first-quarter points on 4-of-5 shooting, but then he only totaled 16 for the game (shooting 7 for 10). You’d be hard-pressed to argue Gobert didn’t wind up outplaying him. The Frenchman totaled 18 points, 10 rebounds and three blocks. Snyder even wound up happy with his big man’s defense. “Rudy obviously anchors us on defense. As teams begin to, or continue to, gravitate toward more spacing with Rudy’s matchup, that’s just something that he is able to do in order to be as effective as I know he wants to be and for us to have the defense that we want to have," Snyder said. “I’ve challenged him, he’s challenged himself. Rudy certainly isn’t going to be perfect, but the effort and the focus and intensity that he has to have, if he brings that, he’ll continue to get better in other aspects of the game." The Jazz have another home game on Thursday night against the Houston Rockets. Tipoff is set for 8:30 p.m. After that, they’re back on the road for a back-to-back set against San Antonio and Oklahoma City this Sunday and Monday. A week from today, they’re back at The Viv against the Heat.